It’s just been over a month since we published the Social CRM Research paper (over 36k views on slideshare) and we’re continuing our cadence here at Altimeter Group of publishing widely available reports under the spirit of Open Research. This time, it’s different, we’ve aligned with who I feel are the smartest team of web analytics minds in the space, John Lovett (ex-Forrester analyst) and Eric Peterson (ex-Jupiter analyst) both of the Web Analytics Demystified firm. 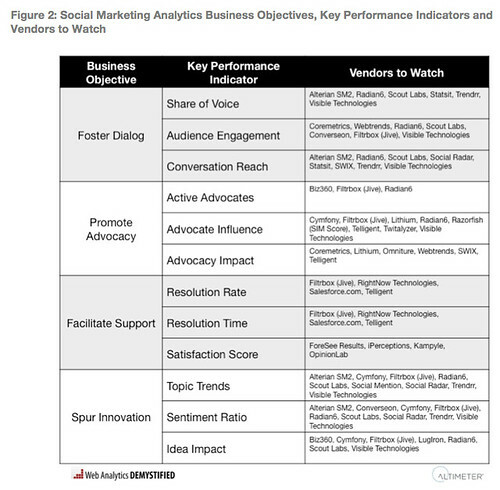 Stemming from Altimeter founder Charlene Li’s (ex-Forrester Analyst) framework, we co-developed this framework, and put our collective minds to work on measuring the rapidly changing social media marketing space. This self-funded research effort resulted in a thorough methodology as we interviewed over 40 ecosystem influencers. Interested in learning more? Attend the no-cost webinar by registering. Marketers around the globe are ranging from toe dipping to jumping all the way into the social marketing space –yet most lack a measurement yardstick. While experiments can fly under the radar for a short term, without having a measurement strategy, you run the risk of not improving what you’re doing, justifying investments, and the appearance of being aloof to upper management. To be successful, all programs (even new media) must have a measurement strategy, and we’ve done just that. Our framework is a common denominator, so if you’re already measuring converted leads, or actual sales from social media, you’re already a leg up! In this meaty report, we hope you’ll share with your marketing and analytics team, and use the actual KPI formulas to create your own cookbook. We’re putting a big stake out there, in order to further the industry to come together around a common set of KPIs and metrics, but we realize we don’t know all the answers. In the spirit of Open Research, we want this to be an open framework (we’ve even licensed this under Creative Commons) to customize it and make your own for non-commercial reasons with attribution. If you’ve ideas on how to improve it such as new KPIs, vendors, or approaches, we’re listening, and will incorporate and improve this community body of knowledge for all to benefit. I’ll link to others that extend the conversation (even critical reviews), feel free to embed the slideshare on your own site. John Lovett, my co-author, on the Web Analytics Demystified Blog. Note, they used their branded report template, but the content is the same. Dennis Howlett of ZDNET suggests this could be the dark side. Shel Holtz gives a review, and suggests we couple our paper with KD’s checklist (PDF). She was one of the respected ecosystem contributors. Dave Fleet writes it’s a good start, and provides good KPIs but wants to see the conversation extend. Alterian’s Connie Benson adds to the conversation and highlights some of SM2’s capabilities. Geoff shares it from his French blog, more international spread. Connie Bensen cascades the research report to her career blog. CJLambert is cynical and doesn’t think a universal ruler can be applied to social media measurement. We look forward to her detailed review later. Francine, a Silicon valley/Phoenix entrepreneur and friend is frustrated that the research report doesn’t write for small businesses, do see my response in the comments. Marshall Spondor from Web Metrics Guru shares the report, has some funny comments about analysts, as well as Open Research, thanks Marshall. Excellent, he’s starting to try it out, see test 1. More global spread, it’s now on German blogs. David Berkowitz shares the report, and points out it’s not a complete list of vendors.